“I received a text from my friend, who was birthing in the next room over: “I heard a baby cry!!!! Yay!!!! Congratulations!! 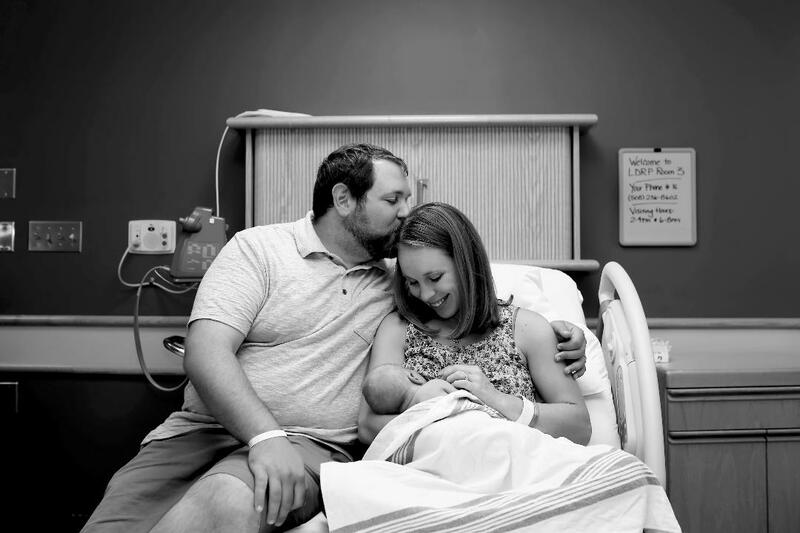 !” She knew before anyone in our family did, just by the crazy chance that we happened to be the only birthing moms at the hospital on Labor Day. Let’s go back a bit before the birth. My due date was August 23rd. Just like his big sister, this baby was not ready to be born on time. The day after my Guess date, it was suggested that if I made it to 41 weeks, I should be induced. Induction was scheduled for August 30th and I was not looking forward to that. I felt stressed and anxious and I wasn’t relaxing enough to let my body do what it was intended to do. August 29th, I went into the OB’s office for a biophysical profile (BPP) and to get a Foley balloon placed. Nerves were high and I went into the appointment feeling defeated. The doctor asked me why I was being induced. I told her, “post-dates” and she asked if there was any reason that the 30th was the day instead of any other day. There was no reason, really. My doctor wasn’t going to be in the hospital until September 5th, so when it was suggested that I be induced around 41 weeks, I selected the 30th, knowing that the on-call OB would be the same one who delivered my first baby. She explained that the 30th was going to be a busy day with medically necessary procedures and because all was still going well with me, she wanted to push induction out as far as possible to give me more time to go on my own. I was sent to the hospital for a non-stress test (NST) just to be sure this plan was a good one. The doctor at the hospital was in support of this plan and the nurse who ran the NST was super supportive of the birth that I wanted. She happened to double as a doula! Things were looking up and I was getting excited! My next (and final) induction date was set at September 5th, which gave me another week to let this baby come in his own time. I went home, relaxed in a hot tub (doctor’s orders!) and felt a newfound sense of confidence and relaxation. We could do this! I knew the schedule of on-call OBs from 8/30 to 9/5 and the one doctor who I wasn’t a fan of was not on the schedule, so regardless of the date, I felt good about the care I’d be receiving. From there on out, I was continuing to have Braxton Hicks waves that were coming at pretty regular intervals, but they kept fizzling out, day after day. I was getting frustrated and feeling defeated yet again, though I was trying to stay positive and make the best of it. I was in the hospital daily for more NST and BPP appointments and got to know all of the nurses well. 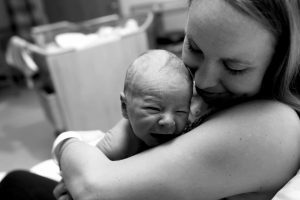 I ended up giving into having my membranes stripped at one of these appointments because if it worked, it would beat the alternative of the impending induction. On September 3rd, after trying every self-induction method under the sun, I purchased and listened to the Come OUT Baby mp3. It was worth a shot, with only 24 hours left until the balloon had to be placed. Monday, September 4th (Labor Day), I woke up at about 4:30am for a pee break. Nothing out of the ordinary there. However, I had some bleeding. Bloody show? I wasn’t sure and I didn’t want to get excited, so I went back to bed. I was having pressure waves, and they felt mildly more real, but again, I didn’t want to get excited. I started listening to my Birthing Day Affirmations, cautiously thinking that it might be my birthing day. At 6:00, I started gently waking my husband and told him, “I think today is the day.” That woke him up! I explained my thinking and he asked what he could do. I told him I was comfortable and just going to continue listening to my Hypnobabies tracks. I was trying to time pressure waves, but every time I tried to record the information, it broke my focus. I texted my parents and told them that today was probably the day, so we would be dropping our daughter off with them within a few hours. I felt relaxed and a bit sleepy, so I let myself drift off. My daughter came into our room at 7:00 and I told her that today was going to be a big day. She was excited to be going to Mimi and Pa’s house, so we got her dressed, gave her something to eat, and drove her to my parents’ house. We walked home (it’s only 4 houses away from ours) and the waves started picking up. I made sure to stay hydrated and got myself some healthy snacks to fuel up while I rocked on a yoga ball. At around 10:30, I started signaling the start of pressure waves to my husband with the word, “now,” so I could keep focus on the hypnosis. They were consistently 4-6 minutes apart and though I wanted to be cautious and not call too early (last time, we were sent home twice before finally being admitted), I thought I should call anyway. The doctor who had been seeing me all weekend got on the phone with me. I explained the bloody show and timing of pressure waves, and he responded, “Oh, thank God!” I laughed. Yes, this is how I was feeling, too. He told me to come on in and get checked, so that’s what we did. We arrived at the hospital and didn’t bring anything in with us, other than the Hypnobabies materials. I was sure we would be sent home because I was really quite comfortable. No pain, just pressure. No fear, just relaxation. We got up to the maternity floor and all of the nurses at the nurses station were smiling and clapping as we laughed at their welcome party. They were so excited and optimistic for us that they had us skip triage and set us up in an LDRP room. I was confused. What if I wasn’t making progress? Were we here to stay? It turns out, the doctor’s idea was that since my balloon was scheduled for 4:30 that day, they would keep me regardless. This was it. Birthing day! At about noon, he checked me and told us I was at a 5. A nurse in the room cheered, “I got it right!” We found out the nurses had all placed bets on my cervical dilation. Yup. Love those nurses! TJ went out to the car to get our bags and I got hooked up to the monitor so they could watch my strip for a while. My nurse knew I wanted to get into the hydrotherapy tub, but I had to be monitored for a bit before I could get in. During that time, I asked at what point I would be cut off from being able to start an epidural. I explained that I did not want one because last time, the worst part of my birth was having it placed, but I was curious anyway, just in case. The nurse explained that if I wanted it at a 9, I would be encouraged to skip it, but there was no real cutoff. She also mentioned that the anesthesiologist was top-notch and I would be in excellent hands if I opted for it. I agreed to an IV instead of the saline lock that was on my wish list, just in case I changed my mind on the epidural. The doctor checked me again (now a 6) and gave the go-ahead on getting into the tub for an hour with intermittent monitoring. The tub felt amazing. I continued with the hypnosis while I was surrounded by warm water and a very quiet room. The only sound was the shower head running on my back. The pressure started getting more intense and I kept reaching for my husband’s hand during those waves. I told my nurse that I wanted to get the epidural after my tub-time was up. Pain-wise, I didn’t need it. Focus-wise, I felt I did. If I could ease the pressure to continue focusing on the hypnosis, I knew I could stay relaxed through the end. It wasn’t my original plan, but I have no regrets about my change of heart. I was checked yet again before getting the epidural, this time about 7.5-8. The end was near! Baby would soon be here! The anesthesiologist came to my room and I stayed completely relaxed and comfortable as the epidural was placed. This was nothing like last time, having to be held down by several nurses, fighting through excruciating pain. Once it was in, I was told to nap, but there really was no time for such a thing. The room was prepped for baby’s arrival as I quickly progressed to a 9 and my water broke. My husband went into the hall to let my parents step in for a minute to wish me well. Last time, my stepmom stayed with me until it was time to push. This time, as soon as she came in the room, baby’s heart rate started dropping, so she helped my nurse with flipping me from side to side. She quickly left the room to tell my husband he needed to be with me. I continued to be flipped onto all fours, right side, left side. I was also given oxygen. I focused on the hypnosis and kept myself blissfully unaware of the fact that baby’s cord was wrapped around his neck. Peace. All I felt was peace and confidence in my doctor and nurses. The doctor got suited up and checked me again, to find out I was at 9.5. I joked with my husband and asked if he also wanted a splash mask, and we were ready to go! Pushing took a bit more time than my first birth because of all of the repositioning – about 40 minutes from start to finish. At 5:20pm, baby arrived with the cord wrapped tightly around his neck, but he was freed and all was well! A perfectly healthy and well overcooked baby. Everyone was impressed with his size – a whopping 8lbs, 4oz and 21 inches. That’s a full 2 pounds heavier and 1.5 inches longer than his sister. Those ultrasound estimates were off! I received a text from my friend, who was birthing in the next room over: “I heard a baby cry!!!! Yay!!!! Congratulations!! 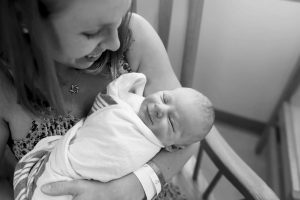 !” She knew before anyone in our family did, just by the crazy chance that we happened to be the only birthing moms at the hospital on Labor Day. I did it! Comfortable, easy, peaceful childbirth with lots of support in all of my birthing choices. It was a very happy Labor Day!